The Time Trial season is coming to an end just as the hill climb season is getting into full swing. 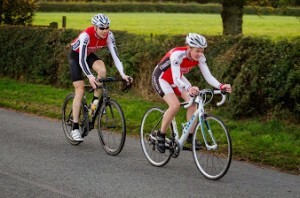 The club recently had three riders in the National Championship 12 hours in Yorkshire. Mike Jones, Edgar Reynolds and Wayne Powell represented the club. The result is to be confirmed. In the West Cheshire 12 Edgar covered 206.82 miles only a week after riding the Le Mans 24 hour race in France. Over the 25 mile distance Steve Hulme recorded 57:17 in the North Shropshire Wheelers event on Sept 10th. In the Stone Wheelers 25 on Sept 13th Kevin Milward and Duncan Poole recorded season’s bests of 56:38 and 1:3:30 respectively. The pair also rode the Nova Raiders 25 on August 30th where they recorded 59:57 and 1:08:10. Sue Blake competed in the Chester Road Club 50 mile TT. A novice at the distance, Sue returned a time of 2 hours 37 minutes. She was riding her training bike having had her racing bike (a Trek Madone) stolen from her workplace. Her preparation the previous day had been a 5.6 mile swim in Lake Coniston completed in just over 3 hours. Sue teamed up with Ben Norbury to ride the Manchester Wheelers Lads n Lasses 10 mile team TT on Aug 29th They finished in 26:48. The photo shows Sue on the bike that was soon to be stolen. Denise Hurst and Wayne Powell also rode. In the Glossop Kinder hill climb on the Snake Pass Ben Norbury was 5th in a time of 13 minutes 31.4 seconds and Tristan Roberts was 3rd junior with 16:30.4. Ben followed this with a 4th place in the Buxton C.C. climb of Long Hill in 13:41.4 with Nick Decker finishing well in 15:46.1. This Sunday the club Hill Climb Championship takes place on Ganny Bank starting at 10:00 a.m. It will be followed by a club ride to Wybunbury. Signing on will be from 09:30 in the lay-by just below the Horseshoe Inn. The weekly Sunday Club Runs and twice monthly Saturdays are a cornerstone of club activity. On 31st August Ten riders turned out for the ride to the Old Fire Station Café in Tarporley, Two potential new members, Megan Giglia and Chris Thomas were welcomed. On 6th September there were 18 riders with a destination of the Riverside Organic Farm near Davenham making a 33 mile round trip. Riders included Kay May visiting from Somerset, and potential new members Jill Jervis and Simon Leyshin. On Sept 14th. 11 riders enjoyed an outing to Audlem on a fine late summer’s day. Others joined them at the cafe. On Sept 20th 14 riders went out to Great Budworth via Lower Withington and Knutsford, returning through the brine fields at Lach Denis to Allostock and Goostrey for a round trip of 42 miles. September 21st was perfect cycling weather for the Sunday ride to Delamere, which was enjoyed by 13 riders. Club member Dave Hurst was diagnosed with prostate cancer in early June of this year. After an intensive course of treatment at the Christie hospital in Manchester he is now in remission. Dave was more than impressed, and humbled, with the speed, care and compassion in which he was treated. He now feels compelled to help raise money and awareness to further the amazing work of the Christie Hospital. On Tuesday the 16th September he will be starting a ride, with support from members of the CTC, a 600 km route including 16 000 metres of climbing from Geneva over the Alps to Nice. 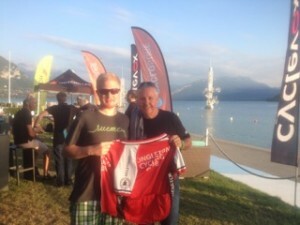 Hats off to Joe Langford who has just completed a 4 day Alpine Challenge event based at Annecy in the French Savoie region. Joe needed special dispensation to ride as he was not yet 18. Richard and Tom Cowan have recently returned from their own climbing “fest” in the Alps. They rode the classic Alpine Cols Challenge between Sept 1st and 7th. Richard carried this fitness on to be 4th fastest in the Grindleford Goat Sportive ride on Sept 13th This was 108 km ride in the Peak District with 1577 metres of ascent. Club Members have enjoyed the spectacle of two great cycle races being televised recently with the Tours of Britain and Spain running simultaneously. Mark Tilstone has just returned from a visit to see the Vuelta A Espania. He says “This was my fifth attendance at the Vuelta since my first trip over there in 2006.” He witnessed Chris Froomes valiant attempt to win the race on stages 14 15 and 16 against the Spanish trio of Contador, Valverde and Rodrigez. In the end he was beaten by Alberto Contador. Mark’s visit to the Asturias region involved riding about 200 miles during which he climbed over 24000 feet. The first 2 stages of the tour of Britain race took place on roads in our region, with stage 1 being in Liverpool and stage 2 going from Knowsley to Llandudno passing through neighbouring West Cheshire. Prior to stage 1 there was a rare opportunity to ride the closed streets of Liverpool before the professionals. Club members Adrian Pennington, Greg Spencer and Ed Wright & family took advantage on Sunday 7th September. Thousands took part in the event giving an opportunity to ride the 8k lap the professionals would later race on. Riders were waved off by Sir Bradley Wiggins and Davina McCall. The clubs triathlon members have been active in September. Brothers Pete and Matt Tatton both competed in Iron Man Wales with Matt finishing in 13 hours and 8 minutes and Pete in 14:10. In the shorter sprint discipline Gill and John Horne competed in the North West Triathlon at Nantwich on Sept 14th and Sue Blake was the bike part of a relay team. More on this in the next club report. The Club meets every Thursday at 8.30 p.m. at the Rugby Club, Park Street, except for the first Thursday of the month where the venue is Beartown Tap. New members are always welcome.